That’s all it took for Trey O’Brien’s life to change, twisted into an unrecognizable mess. Paralyzed by the weight of his guilt, he was numb to anything that wasn’t his self-induced loathing and isolation. And that was on a good day. Callie loftier spent the first part of her life in the shadow of her illness. Two years ago, she was given a second chance, and she intended to live life to the fullest. She danced in the rain, sang as loud as she could and met every adventure head-on. Life was short, and since she knew nothing was permanent, she had no time for things like falling in love. But when Trey and Callie collided, life blurred into something beautiful. Could the secret Callie carries with her ruin everything and bring the entire O’Brien family down? Or will it be exactly what Trey needs to pause, and remember how to live again? 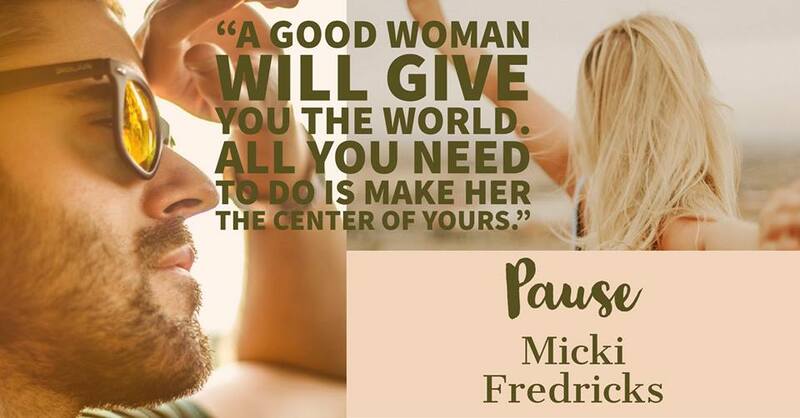 I am a Book Hoarder is hosting a party to celebrate the release of Pause, the newest novel by Author Micki Fredricks! Join the group today and be ready to party on July, 15th from 7pm-10pm! If they’d known about ADHD when I was little, my Ritalin dosage would’ve been OFF THE CHARTS!! It goes without saying; I spent A LOT of time by myself after the teacher moved my desk out into the hallway. ** Silver lining** With all that alone time on my hands, I used my imagination to make the world a more interesting place. When I was little, people said I had an active imagination. In elementary school, teachers called me a daydreamer. My high school counselor said I needed to learn how to focus and my college professors warned me to buckle down if I wanted to be successful. Before I knew it, it was time to grow up. So that’s what I did. I grew up, got married and had five kids. I work as a full-time nurse, I’m part of the most amazing book-club, blog about books with my best friends and spend my days defusing the drama that only a household full of teenagers could bring. Oh, and I write a bit when I can and now people call me talented. Moral of my life story: Hug your kids and embrace their differences. Love them for who they are. Someday, the traits you think are struggles might be exactly what they need to make their dreams come true. Micki lives in small-town Iowa with her husband, kids and a fat Cocker Spaniel named Joey.